If you are wondering why the Ford Fusion Energi is getting so much attention these days, look more to the performance features in this plug-in hybrid to understand why. 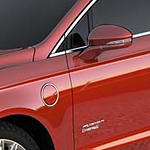 One of the performance features in the Ford Fusion Energi that also serves as a safety feature is the model's lighting system: LED taillamps and headlamps. These lights make it a lot easier to navigate the roads in all sorts of weather conditions. The bonus here is these lights also make it easier for other drivers to quickly see your vehicle and take action to avoid getting into an accident. The anti-lock braking system in the Ford Fusion Energi is designed to bring the vehicle to a stop more safely than other vehicles. Once you slam on the brakes, braking power goes to the wheels in different ratios to bring the car to a stop faster and easier. Visit Korum Automotive Group and then you can take the new Ford Fusion Energi for a test drive.